What is an 80-10-10 or Piggyback Mortgage? Piggyback Mortgage Loans is a slang for a second mortgage tied to the back of a first mortgage to be used at the same time for a home purchase. What Is An 80-10-10 Or Piggyback Mortgage Loans And Who Offers Piggyback Loans? Many home buyers often call me to ask whether The Gustan Cho Team at Loan Cabin Inc. offers Piggyback Mortgage Loans. 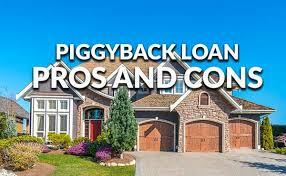 Piggyback Mortgages are second mortgages used to Piggyback off the first mortgage on a home purchase. Many Piggyback Mortgage Lenders will have minimum credit score requirements. Waiting Periods After Bankruptcy And/Or Foreclosure: When applying for a Piggyback Mortgage Loan, make sure that you find out what the minimum waiting period after a bankruptcy or foreclosure is before you start application process. If you are interested in obtaining a 80-10-10 mortgage with a Piggyback Mortgage, please contact us at 262-716-8151 or text for faster response. Or email us at gcho@gustancho.com. What Is An 80-10-10 or Piggyback Mortgage and how can a FHA Borrower benefit from it? What Is An 80-10-10 or Piggyback Mortgage and how can a Jumbo Borrower benefit from it? The main problem home buyers have is that they cannot come up with the 20% down payment on a Jumbo Mortgage. These home buyers can easily afford the monthly jumbo mortgage payment, however, they do not have the substantial down payment Jumbo Mortgage Lenders require so a 80/10/10 Mortgage would solve the problem because all the high end home buyer needs to come up with is 10% down payment. Gustan Cho Associates Mortgage Group are experts in structuring 80-10-10. Mortgages for home buyers. Home buyers interested in learning more about What Is An 80-10-10 Mortgage and see if they qualify, please contact us at Gustan Cho Associates at 262-716-8151 or text us for faster response. Or email us at gcho@gustancho.com. The Gustan Cho Team at Loan Cabin Inc. is available 7 days a week, evenings, weekends, and holidays.